The UN is looking into classifying violence and discrimination against people based on their gender and sexual orientation as a human rights violation. In the US, the FBI calls this a 'hate crime.' Will the UN study make it possible, someday, to rightly punish perpetrators of hate crimes against people due to their gender or sexual orientation - in all countries, in all contexts? And will they not only to make an international human rights law, but find a way to uphold the law as well? Let's hope. For more on hate crimes, check out the story of Matthew Shepard in the Tectonic Theater Project's docu-drama, The Laramie Project. 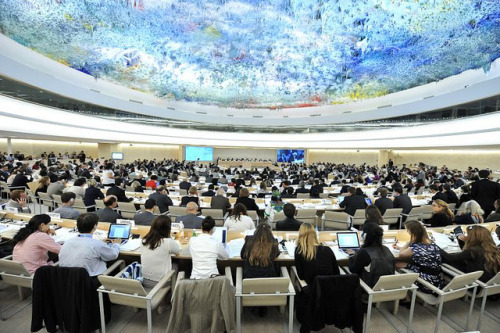 Today the UN Human Rights Council took action on a resolution on human rights, sexual orientation and gender identity, expressing grave concern at discrimination and violence against individuals based on sexual orientation. As a result, it requested the High Commissioner to commission a study to be finalised by December 2011 to document discriminatory laws and practices and acts of violence against individuals based on their sexual orientation and gender identity, in all regions of the world, and how international human rights law could be used to end violence and related human rights violations based on sexual orientation and gender identity. It also decided to convene a panel discussion during the nineteenth session of the Human Rights Council, informed by the facts contained in the study commissioned by the High Commissioner. The vote result was 23 in favor, 19 against and there were three abstentions.